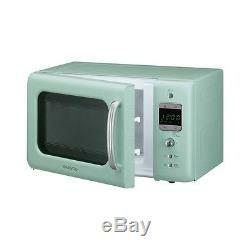 Breville Strata Jug Kettle & 4 Slice Toaster with Daewoo Microwave - Green. 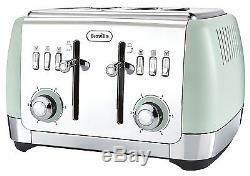 Breville Strata VTT768 Four-Slice Toaster - Green. 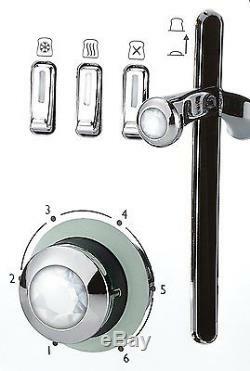 Stunning crystal design on levers and dials. Variable width bread slots for thick and thin slices. Defrost, re-heat and mid-cycle cancel buttons. The Breville VTT768 Strata Four Slice Toaster in matt green with mirror chrome accents and crystal design on the levers and dials adds a touch of elegance to any kitchen. Functionally, its one of the best toasters around offering a range of features including a Lift and Look, which allows you to check your toast mid cycle without having to cancel. When you do need to stop the cycle early, the cancel button is on hand, as is the defrost and the reheat, which lets you warm up unbuttered toast. The variable width slots make it perfect for thick and thin slices and the high lift means no more burned fingers with smaller items such as crumpets or bagels. The Breville Strata also comes with cord storage and removeable crumb trays which help keep your kitchen clean, tidy and clutter free. 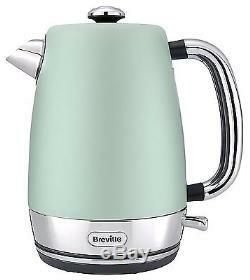 Breville Strata VKJ998 Jug Kettle - Green. 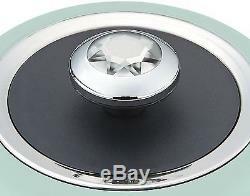 Stunning crystal design on levers and lid. Easy to read water gauge. Removable and washable limescale filter. 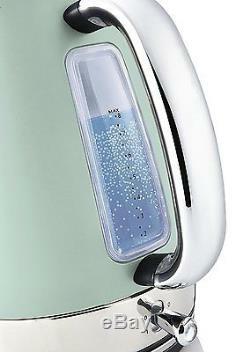 The Breville VKJ998 Strata Jug Kettle in matt green with mirror chrome accents and crystal design on the levers and lid adds a touch of elegance to any kitchen. Functionally, its one of the best kettles around and is ideal for families of all sizes with a 1.7L capacity which can make around 6-8 cups when filled. The 3kW rapid boil technology makes it boil in no time and the easy to read illuminating water gauge lets you fill it to just the right level when fewer cups are required. The 360-degree base makes it easy to use for left and right handed people and with an easy fill, lift off lid and cord storage, the Breville Strata jug kettle helps keep your kitchen clean, tidy and clutter free. 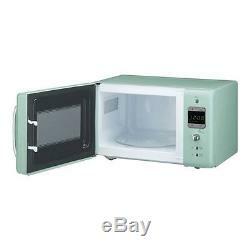 Daewoo Retro KOR7LBKM Microwave Oven - Green. Child safety lock on door. Auto cook one touch cook menus. 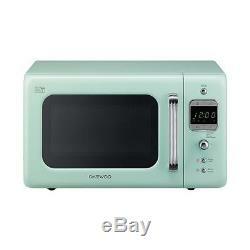 The Daewoo KOR7LBKM Microwave Oven in mint green comes in a stylish design that not only looks great, but is also highly functional and easy to use. It has 5 power levels to ensure your food is prepared to perfection every time, an auto cook function and one touch cook menus that let you make some of your favourite meals at the touch of a button. The 20L capacity gives it ample space for most family sizes and the 800 watts of power lets you cook or reheat your food in no time. The digital display makes the Daewoo retro microwave easy to use and cleaning the microwave is simple, requiring a wipe down with a dish cloth. The plate inside can be removed and is dishwasher safe and for your peace of mind, the door comes with a child safety lock. Free P&P within mainland UK. When the order consists of multiple items, they may arrive separately and on different days. These items may be dispatched directly to you from a third party distributor. 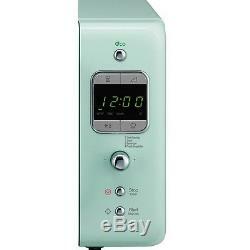 Please note that the voltage is only suitable for 220 240v outlets. An earthed 13 Amp plug adaptor will be required for electric appliances that are to be used outside of the UK. 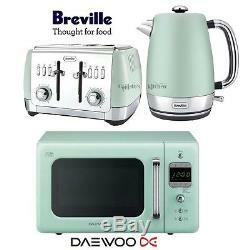 The item "Daewoo Retro Microwave & Breville Strata Kettle and Toaster Set Mint Green New" is in sale since Wednesday, February 08, 2017. 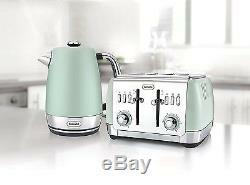 This item is in the category "Home, Furniture & DIY\Appliances\Coffee, Tea & Espresso Making\Kettle & Toaster Sets". The seller is "zell-callisto" and is located in Tredegar. This item can be shipped to United Kingdom, Austria, Belgium, Bulgaria, Croatia, Cyprus, Czech republic, Denmark, Estonia, Finland, France, Germany, Greece, Hungary, Ireland, Italy, Latvia, Lithuania, Luxembourg, Malta, Netherlands, Poland, Portugal, Romania, Slovakia, Slovenia, Spain, Sweden, Australia, Russian federation, Brazil, Japan, New Zealand, China, Israel, Hong Kong, Norway, Indonesia, Singapore, South Korea, Switzerland, Taiwan, Thailand, Saudi arabia, South africa, United arab emirates, Ukraine.